“Is this fun?”, asked my brother Adam, as we cycled around another winding bend high into the mountains above Lake Garda. The gruelling ascent had left us sweaty, fatigued and saddle sore – and unsure of our sanity in voluntarily signing up for this painful outdoor adventure. But we were not alone in our two-wheeled mission to explore the wilder side of Italy’s biggest lake. The northern section of Lake Garda is somewhat of a Mecca for mountain bikers. With hundreds of miles of world class trails heading into the craggy peaks that surround the water, the local tourist board claims it is the “best bike resort in Europe”. Even with all the best intentions it can be hard to be as active as you like in your every day life. That’s why holidays are perfect for getting your sweat on while having fun! Chances are the weather will be more likely to play ball abroad too. This Canvas favourite really does have it all and sports fans will not be disappointed. Its location, close to Paris, makes it a great base for spending a day at tennis’s French Open or catching the closing stage of cycling’s Tour de France. Plus, on site you can take part in a wide range of activities, from football to fishing, or table tennis to trampolining. Check out the FamilyExtra programme onsite for slightly more obscure sports – waterwalkerz anyone? Although there are an array of different electronic games and DVDs to keep children occupied on car journeys, playing games together can be fun and helps to break up the journey. Each person is allocated a colour and has to count the number of cars they spot in their colour, gaining a point for each car. Each person can also be allocated a different bonus vehicle – e.g a fire engine or ambulance, which gets 3 points. The first person to 10 or 20 points wins. Wimbledon fortnight kicks off today. And that means I’ll be glued to the games, pondering whether it’s time to dust off my dusty racket. Call us biased but we really do love camping. There’s something so relaxing about staying outdoors, enjoying every meal al fresco, and getting to enjoy the simple nature of a holiday on a campsite. The fact that a lot of campsites in Europe have amazing facilities means that there’s bound to be something to keep every member of the family happy. Have you seen some of the amazing waterslides?! For some people, the idea of a camping trip is their worst nightmare – they think it’s cold, damp, dirty and a lot of hard work. Nevertheless, there are some undeniably lovely aspects of camping: feeling at one with nature, getting back to basics and sharing some great bonding experiences as a result. However, a stay in a safari tent has all the benefits of camping, but without any of the rigmarole. Spacious, comfortable and stylish, Canvas Holidays’ Safari Tent Deluxe has got all the comforts you’d find in a house – lounge, kitchen, dining area – with all the benefits that come with being in the great outdoors! What’s more, the tents even boast plumbed-facilities meaning you don’t have to leave your tent when nature calls and can enjoy a shower as soon as you get up. 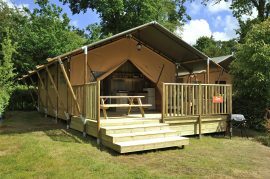 Domaine des Ormes at Dol-de-Bretagne is one of France’s finest campsites. There’s loads going on here for families and couples alike – including an 18-hole golf course, cricket pitch and riding school. Not to mention the amazing pool complex, tree-top adventure course and Canvas’ free FamilyExtra club. That’s why for the 2015 season you’ve rated the campsite 4.6 out of 5! Well of course we’d say that. But it’s true, we do. And we want you to love camping too. Because a Canvas holiday couldn’t be more different. We give you the freedom of camping without the feeling of having to rough it. Picture yourself relaxing in luxury accommodation, surrounded by beautiful countryside, enjoying a glass of local wine while the barbecue sizzles and the children play nearby. YOU can still have awesome outdoor adventures in the rain. Being adventurous is simply a mindset – a determination to overcome obstacles and squeeze every last drop of fun out of any situation. And that is the approach my brother Adam and I have taken to the first three days of our trip to Lake Garda with Canvas Holidays. The weather has been, well, dramatic – thunder has roared, fork lightning has flashed and torrential downpours have soaked everything in sight. But the adventure show has continued. While other gloomy holidaymakers have wrapped themselves in blankets, looking up from their sun beds accusingly at the grey skies, we’ve been out exploring the best Lake Garda has to offer. Mountain trekking, lakeside walks, refreshing swims and paddle boarding have been on the adventure menu – and every tasty course has satisfied our hunger for outdoorsy excitement. France in the summertime… you can’t beat it! When the sun is shining, the beautiful beaches, delicious food and incredible landscapes become even more irresistible. Here are five hot spots perfect for your summer escape, all perfect for soaking up the rays with a glass of delicious French wine in hand.